1931 CHINA FLOODS The 1931 China floods or the 1931 Yellow River floods were a series of floods that occurred in the Republic of China. The floods are generally considered among one of the deadliest natural disasters ever recorded, and almost certainly the deadliest of the 20th century (when pandemics and famines are discounted). Estimates of the total death toll range from 145,000 to between 3.7 million and 4 million METEOROLOGICAL CAUSES From 1928 to 1930, a long drought afflicted China. By some accounts, abnormal weather over central China began in the winter of late 1930. Heavy snowstorms in the winter were followed by a spring thaw and heavy rains that raised river levels significantly. The rain grew heavier in July and August 1931. 1931 was also characterized by extreme cyclone activity—in July of that year alone, nine cyclones hit the region, whereas on average only two occur per year. DEATH TOLL AND DAMAGES Chinese sources usually indicate the death toll of the Yangtze River overflow at about 145,000, with flood damage affecting around 28.5 million, while most Western sources give a far higher death toll of between 3.7 and 4 million people. Yangtze River The worst period of flooding was from July to August 1931. In July alone, four weather stations along the Yangtze River reported rain totaling over 600 mm (24 in) for the month. Huai River The Yangtze and Huai River floods soon reached Nanjing, the capital of China at the time. The city, located on an island in a massive flood zone, suffered catastrophic damage. Millions died of drowning while some died from starvation or from waterborne diseases such as cholera and typhus. Wives and daughters were sold by desperate residents, and cases of infanticide and even cannibalism were reported in stark details to the government. Some of the areas affected included Hubei, Hunan, Jiangxi, Wuhan, and Chongqing. The high-water mark was reached on 19 August at Hankou town in Wuhan, with the water level exceeding 53 ft (16 m) above normal. Comparatively, this is an average of 5.6 ft (1.7 m) above the Shanghai Bund. On the evening of 25 August 1931, the water rushing through the Grand Canal washed away dikes near Gaoyou Lake. Some 200,000 people drowned in their sleep in the resulting deluge. 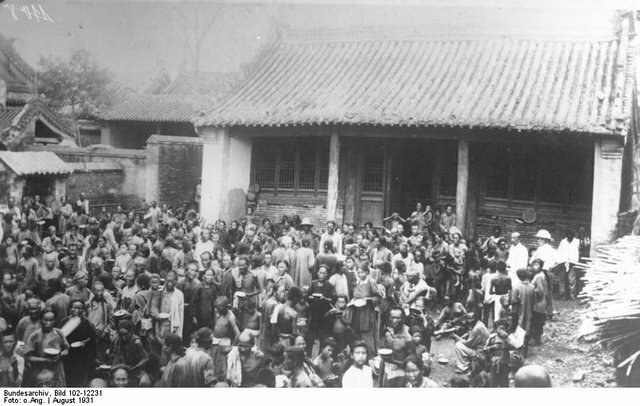 GOVERNMENT REACTION Republic era (1930s–1940s) In the wake of the disaster, the Nationalist government set up organizations such as the Huai River Conservancy Commission to address flood problems. However, due to a lack of funding and the chaos of the Second Sino-Japanese War and the subsequent Chinese Civil War, the various commissions were only able to construct small dams along the Yangtze River. Communist era (1949–present) In 1953, after the end of the Civil War, Chinese Communist Party leader Mao Zedong travelled to the Yangtze River to promote the Three Gorges Dam flood control project. "The Socialist Three Gorges Dam project should excel other major projects in Chinese history such as Qin Shi Huang's Great Wall and Sui Yang Di's Grand Canal", he stated. Scientists and officials who raised doubts, such as Chen Mingshu, were persecuted as rightists. Li Siguang, a prominent scientist and minister of geological resources, told Mao he would commit suicide if he could not stop the construction of the dam. The project did not move beyond the planning stage in Mao's time, due to a lack of resources, rising Sino-Soviet tensions and the upheavals of the Great Leap Forward. The project was restarted in the 1980s, and the hydroelectric Three Gorges Dam began full operation in 2012, becoming the world's largest power station in terms of installed capacity at the time. NOTE: I cannot tell if you are the author, so ensure you have proper verification in your post (or in a reply to me), for humans to check!